1. Perhaps like many of you, I’ve been scratching my head at Sep Vanmarcke’s decision to leave Garmin-Sharp after his contract expires at the end of the season. This is certainly a strange situation as there were no public conflicts between Vanmarcke and Garmin-Sharp management and the young Belgian’s talent is without question. One would assume that a Belgian team such as Lotto-Belisol has made Vanmarcke an offer he cannot refuse, but he says that’s not the case. As a result, Vanmarcke was left-off Garmin’s roster for the Vuelta and competed in his final World Tour race of the season this past Sunday in Plouay. As for his new destination, my money’s on Saxo Bank-Tinkoff Bank or Team Sky. 2. Realizing that Heinrich Haussler, Tyler Farrar, and Johan Van Summeren might not be the best answers to Garmin-Sharp’s cobbled classic needs, GarminSharp General Manager Jonathan Vaughters is close to signing 2010 Tour of Flanders-winner Nick Nuyens. The move makes a lot of sense: Nuyens is a cerebral and talented rider who has a relatively consistent track record in the hillier cobbled classics (at least when he’s healthy). His English is impeccable and he brings a wealth of experience to the table. In short, he’s a perfect fit. Expect Nuyens to be the protected rider for Flanders, with Vansummeren getting the nod in Roubaix. Farrar will have his chance in Ghent-Wevelgem, while Haussler—if he ever finds his legs again—will play the “joker”. 4. Last but not least on the Belgian front, BMC’s Philippe Gilbert finally won a race this season—almost a year after taking his 18th victory of 2011. Whatever the reason for the Belgian’s lack of results in 2012, it’s good to see him back in top form and perhaps ready to challenge for a World Championship on a course that (finally) suits him. I think most Belgians would be satisfied with a two-win season for Gilbert—if one of them brings with it a Rainbow Jersey. 5. Moving to Spain, does anyone else wonder if the 2012 Vuelta a Espana is giving us a sneak preview of the 2013 Tour de France? Rumors abound that the 2013 Grand Boucle will be one of the hilliest in recent memory with a course well-suited to the likes of Alberto Contador, Chris Froome, etc. The aggressive racing we’re seeing in Spain makes me especially excited for those rumors to prove true. 6. As for the race itself, I have little faith in Joaquim Rodriguez’s ability to win the race overall—despite his current lead. I suspect that Rodriguez has targeted the early summit finishes more so than the rest (as he did in the Giro) and he’ll certainly lose at least a minute or two in Tuesday’s time trial. Expect the race to come down to a battle between the Spanish Grand Tour’s two best all-rounders: Contador (who foolishly “gave away” a stage win Saturday) and Froome (the event’s best time trialist and captain of its strongest team). 7. 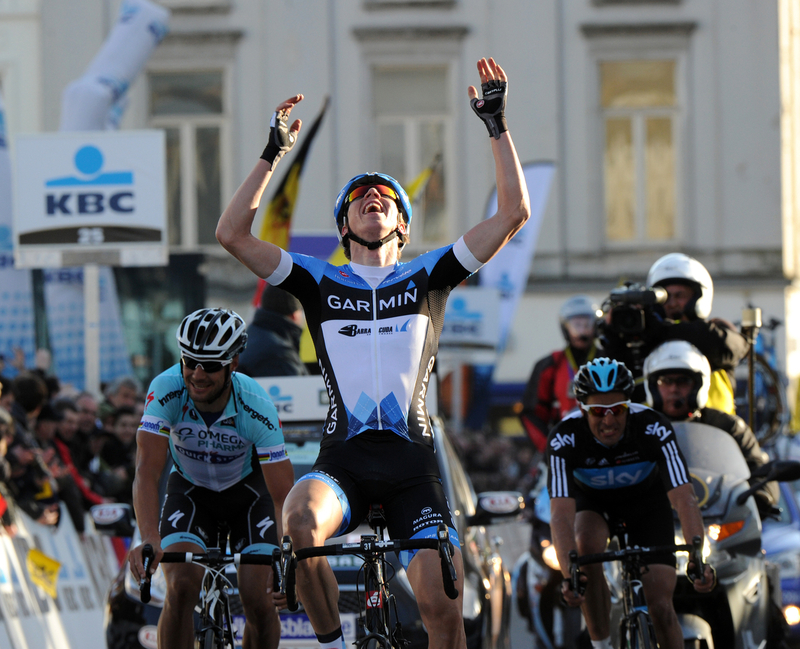 In France, Team Sky’s Edvald Boasson Hagen won the GP Ouest France in Plouay. Is it just me or does EBH seem to specialize at winning races during lulls in the one-day racing calendar? With Juan Antonio Flecha heading to Vacansoleil, will the 25-year-old Norwegian come through in next year’s Spring Classics? 8. In other news, it looks like Tony Martin has a clear shot to defend his World Time Trial Championship in Holland next month. The German appears to be getting in some solid training at the Vuelta, and his two main challengers—Bradley Wiggins and Fabian Cancellara—have both announced they won’t be competing in the event. I’m sure Tony would prefer to win another title by beating the world’s best in the discipline, but hey, a rainbow’s a rainbow. 9. Did you know? Since turning professional with HTC-HighRoad in 2010, Tejay van Garderen has eleven top-10 stage race overall finishes on his resumé—and no wins. Share your own comments and musings below—it will be nice to hear from again! This entry was posted in Musette. Bookmark the permalink. Whit, first of all, welcome back! I clicked thru from another blog expecting to see your “Saying Goodbye…” post, and was pleasantly surprised to see that you and the staff had been back since June with TdF previews and coverage. Concerning Philippe Gilbert, it was great to see him win the stage on Sunday. After that, I’m sure he is revisiting the race book for stages 12 and 19, especially 19 if he has enough gas in the tank after the hard run of stages 14 thru 17. I seem to remember that last year or the year before, the Pave staff did a post on the past 10 WC’s and corrrelated podium success to participation in the Vuelta. It would be interesting to see that updated, and to see how many “Success Factors” that Philippe would meet after this year’s Vuelta. Again, a belated welcome back, and a thanks for the commentary and insight.